Nail-down: The traditional (and primary) method for installing hardwood. The installer nails (or staples) each board to the sub-floor, and then nails (or staples) that board into the next board in the line. This process is continued across the entire floor. Glue-down: Floor boards are glued to the sub-floor using a strong adhesive. Call or click to set up a free no obligation shop-at-home appointment with one of our design consultants today. 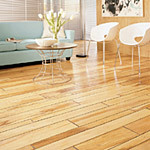 We’ll bring a variety of hardwood samples to you.